Our own Solitary Bubble…… | Which me am I today? …brought such a response, especially from people reaffirming what I thought was true. Sometimes, I wonder if it’s ‘just me’ as dementia is a lonely place sometimes. I live alone yet have the wonderful company of my silent community on Twitter to keep me company or I can be in a crowded room yet still feel alone, such is the chaos and confusion all the noise and conversation makes. So it’s why I often put things on my blog, just to see people’s response; to check I’m not alone in my thoughts. I know I’m lucky to be able to do this – to type a blog, to have a silent conversation on Twitter. Typing being my escape from dementia. I see a chappie frequently in town who clearly in my eyes is living with dementia. The locals refer to him as ‘not quite right’, but not in an unkind way. He’s always alone but he sits happily in the bus station on the benches and chats to anyone politely who sits beside him, about the weather, and smiles contentedly. He gets on the same buses and travels to the terminus and back and then hops on the next familiar one or repeats the first. Most drivers seem to know him and are kind and understanding. He’s happy and content in his trundling world. This is the routine he’s devised for himself. So not everyone has insight, purposely creates strategies and solutions. They just get on with their life as best they can. Perhaps they’re not even aware of their diagnosis. Helping themselves and hoping others will be kind along the way. 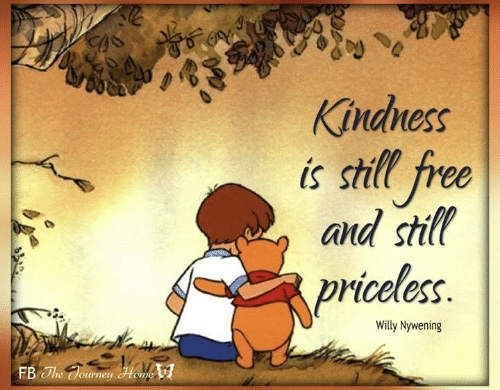 However, it’s when kindness gets lost and forgotten that problems arise. Like when an unfamiliar, possibly new driver, wouldn’t let him back on the same bus as he’d already been on it 3 times that day. He then sat alone on the bench, confused and sad, his routine broken by unnecessary words. Moments later, I was about to move and sit by him, when another man sat down and started chatting to him and the smile appeared on his face and all was right in the world again for him……because someone was kind. The villages who catch my bus always make sure I get on the right bus, especially if its busy or the bus parks in a different place. All eyes are on me, as I often wait in a quiet spot further down. I appreciate their kindness especially when it’s confusing. Kindness costs nothing and can make someone’s day. Harsh words cost nothing and can throw someone’s world into disarray……I know which I like best…..how about you? Your guy could be on the autistic spectrum too – just a thought. I love how kindness makes things right! The thought that it takes a village to support someone living with dementia is so true and you obviously live in an amazing place with folks that care. You are such an inspiration and amazing advocate for yourself as well as others living with dementia! Kind regards from a very cold Calgary in Canada. Often there are comments I would like to share with others. Do I need permission to share them? May I copy your comment about kindness “Kindness costs nothing…” and put it on my social media site? I will give you credit! I think it is too good to not pass on to the world!! Thank you for sharing your journey in such a kind way. Thank you. My family has a history of dementia and my sister has early onset short term memory loss. Your posts are helping me understand better how she might be feeling, how to relate to her better, how to help her in just daily life. Thank you for being real and practical. Thank you for sharing feelings and struggles. Thank you for your kindness to the world. I love your piece about kindness. Your messages to raise awareness of this disease and it’s impact on those living with it, and their families, deserve a wide audience. Thank you Wendy. Thank you for your blog Wendy. My partner was recently diagnosed with early onset alzheimer’s. Your book and blog are helping me to understand his world better and what I can do to help but also what I do that can hinder. It has been my buoy as we chart uncertain waters.